Exposure of the baby to second-hand smoke can lead to deformities of the feet, hands, palate (the risk of cleft lip and palate is twice as high if the expectant mother smokes between one and 10 cigarettes a day) and even the heart. In a U.S. study that examined 14,000 children, it was determined that the risk of heart failure increases by 19 percent if a woman smokes during pregnancy. In addition, researchers came to the conclusion that the children of nicotine-addicted mothers were still struggling with the consequences at the age of eight. They found that these children had poor blood lipid levels, which increase the risk of serious complications such as high blood pressure and stroke during adulthood. Smoking not only has a negative impact on the mother’s lungs but also attacks the baby’s respiratory system. 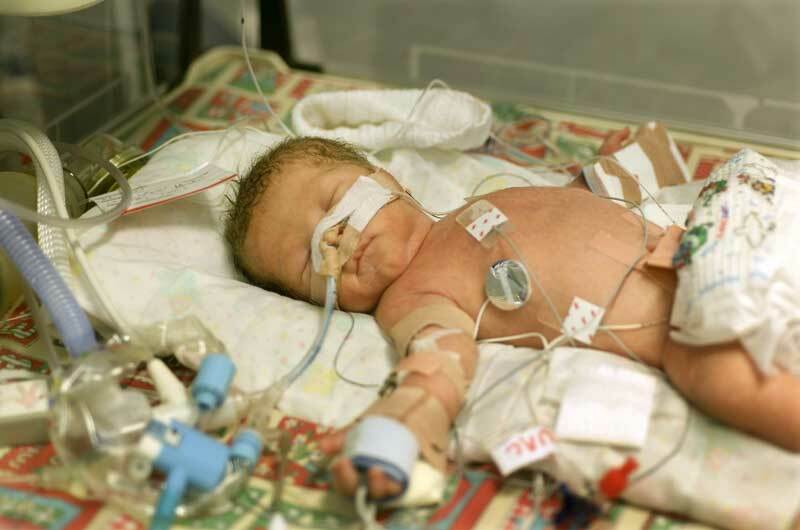 Nicotine causes a decrease in lung function that affects the child after birth. A shocking 28 percent of exposed children struggle with respiratory diseases such as asthma during their first year of life. Whether the mother breathes in first-hand or second-hand smoke during pregnancy, the baby’s risk of allergic diseases is significantly increased because of its higher IgE (a defensive substance produced by the body that is directly connected with the emergence of allergies) levels after birth. Tobacco smoke releases many pollutants that reach the baby’s bloodstream through the placenta. This allows carcinogens such as polycyclic aromatic hydrocarbons and nitrosamines to enter the child’s body and damage genetic material. Swedish studies have shown that just 10 cigarettes per day increase the child’s risk of suffering from leukemia or other cancers later in life by 50 percent. Children of smokers are often born underweight. They weigh an average of 200 grams (0.4 pounds) less than children of non-smokers and have a smaller head circumference. If more than 20 cigarettes are consumed per day, the newborn can even weigh around 350 grams (0.8 pounds) less. One in seven children of nicotine-addicted mothers are born prematurely, and about 15 percent of all premature births are the result of cigarette smoking during pregnancy. Stillbirth can also occur as a result of nicotine consumption. A mother who smokes more than 20 cigarettes per day is more than twice as likely to have a baby that is stillborn than pregnant women who do not smoke. The risk of sudden infant death syndrome (SIDS) also increases. According to the German Cancer Research Center in Heidelberg, these risks can be significantly reduced if the mother gives up smoking by the 16th week of pregnancy. Babies of smoking mothers exhibit withdrawal symptoms after birth. The Brown Medical School in New York found that newborns of mothers who consumed six cigarettes a day had to struggle with withdrawal symptoms for 48 hours after birth. This was supported by the fact that these children suffered from nervousness, easy excitability, tremors, gastrointestinal problems and high blood pressure. In addition, children of smoking mothers later often struggle with nicotine dependence themselves because they have a higher number of nicotine receptors in the brain. If the mother also experiences stress during pregnancy, this risk further increases. Smoking is harmful to health in general. 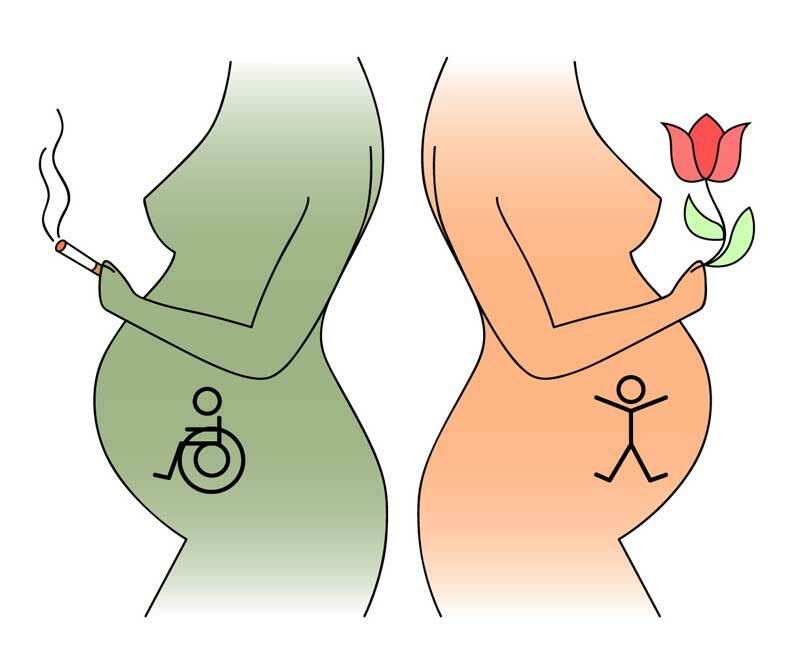 During pregnancy, however, nicotine addiction can have fatal consequences. Expectant mothers who continue to smoke not only harm themselves but also—and this to an even greater extent—their unborn child. Therefore, it is crucial that pregnant women immediately refrain from cigarettes. While some have claimed that abrupt quitting during pregnancy may lead to withdrawal symptoms in the child, there are no studies that confirm this. In order to protect the health and development of the baby, the addiction should be overcome as soon as possible. If this isn’t feasible through personal willpower alone, professional help should be sought right away. A variety of techniques such as acupuncture and hypnosis can aid in detoxification. 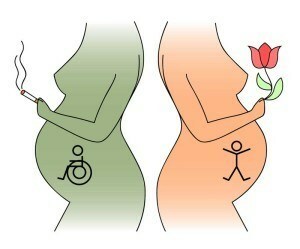 Pregnant women should not hesitate to seek support. After all, the health of the baby is at stake, and giving up cigarettes is a small sacrifice in comparison.